Enzymes are Nature’s catalysts, but they also mediate many reactions useful to the synthetic chemist. In the realm of polymer chemistry, biocatalytic pathways to polymeric materials have received much attention due to the environmental benefits associated with enzymes. Enzymes are non-toxic and derived from renewable resources, while most conventional polymerization catalysts are not. Moreover, the high stereo-, regio-, and substrate-selectivity of enzymes coupled with their ability to perform under mild conditions make them attractive as catalysts for the synthesis of monomers and polymers. Thus, biocatalysis is a vibrant field of research in polymer chemistry with many potential industrial applications. In Biocatalysis in Polymer Chemistry a team of experts reviews fundamental studies, applications, and the successes and challenges of all relevant biocatalytic processes. The book is well-written, easy to understand and provides a complete overview of the state-of-the art in this area of research. As you would expect, the main focus of the book is on enzymatic polymerizations. The chapters are organized into the various classes of polymers that have been synthesized using biocatalysts. The synthesis of polyester by lipases, of polyamides and polypeptides by proteases and lipases, as well as the polymerization of vinyl-, and phenolic monomers by oxidoreductases are reviewed. Oxidoreductases have also been applied to the synthesis of conductive polymers such as polyaniline. Further chapters are dedicated to the synthesis of polysaccharides by glycosyltransferases and phosphorylases, as well as the bacterial synthesis of polyhydroxyalkanoates and related compounds. A number of well-selected chapters cover adjacent topics and rounds out the book. These review monomers from renewable resources, enzyme immobilization, biocatalysis in non-aqueous solvents, the synthesis of chiral polymers and of block copolymers, molecular modeling to elucidate polymerase mechanisms, and enzymatic polymer modification and degradation. One aspect, however, could have been reviewed in more detail: Biotechnological routes to enhanced biocatalysts, such as directed evolution or rational design. Each chapter concludes with a section discussing the current state of the art and highlighting future challenges. Reading these sections is eye-opening as, on the one hand, they show the great advancements that have been made in applying enzymes in synthetic polymer chemistry while, on the other, they point out many aspects of biocatalysis that have not yet been explored or elucidated. Thus, there is plenty of room for innovation and a tremendous scientific playground available for researchers who wish to engage this field. This will certainly inspire future research efforts. In conclusion, the book covers all major enzymatic systems used to synthesize and modify polymers or monomers in an adequately detailed way. 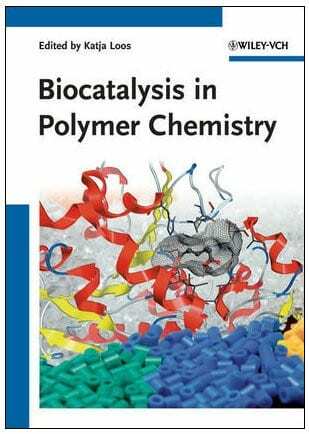 Therefore, the book is an excellent resource for researchers looking for an in-depth yet comprehensive overview of the field of biocatalysis in polymer chemistry, and it is an indispensable reference work for researches already active in this field.